I have never been a jam lover, but this changed within hours after the birth of Baby A. In the Post Delivery Ward where I was kept for observation, the mini kitchen was stocked with a variety of cereals, toast with a selection of jams and marmalade for breakfast. Not in the mood for the boring cereal and in the need of a sugar rush, I naturally reached out for a couple of tubs of mini jams and I was hooked!! For the next three months I just had the urge to treat myself to toast and jam for breakfast every single day (I cant believe now that I was soooo addicted to jam). Fortunately with time, my love for jam has begun to wane, until very recently I visited the Dorset Chilli Festival. Just reading the name of the jam on the jar, and seeing such deep vibrant cherries in a bottle with added Port was enough to tempt me into tasting it. This was enough to awaken the dormant jam demon within me :) and left me ever so determined to make my own. 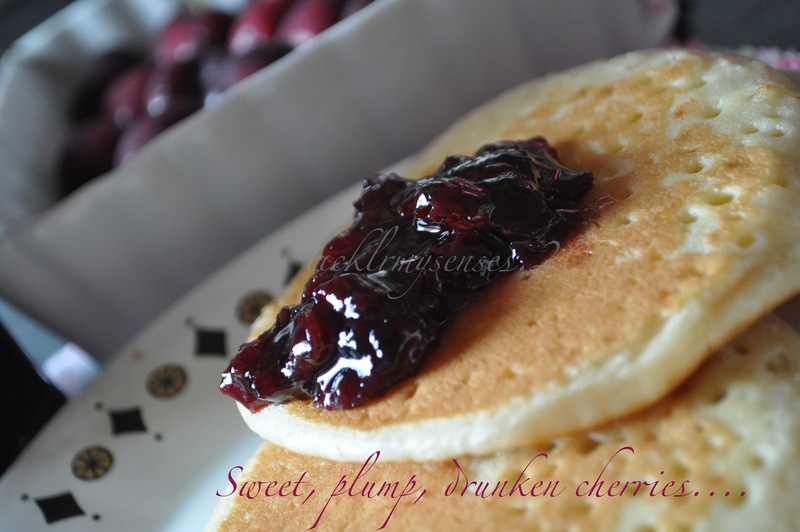 Not much into jam making ( though my mom is a pro at it) I hunted for a good recipe, managed to find a simple step by step pictorial for "a no recipe cherry jam" online and instantly liked it. I slightly adapted the recipe to include port, and voila what you end up with is lovely textured jam, truly intense, full-bodied and bursting with deep ripe cherry flavors. This David Lebovitz's recipe is simple, fuss free and delicious with just one rule "for every cup of cooked cherry and its liquid add 3/4 cup of sugar". For a detailed pictorial guide visit his page. Zest and juice of lime or lemon: 1 no. 1. Rinse the cherries and remove the stems. Using a Cherry pitter or a knife pit the cherries. Chop about 3/4ths of them into smaller pieces, the rest leave whole for a varied texture. 2. Cook the cherries in a large stainless steel vessel with just enough port wine and apple juice to soften or wilt cherries. Apple juice contains pectin that will cause the jam to set/ gel. Add the zest and juice of one fresh lemon. Lemon juice adds pectin as well as acidity, and also help the jam gel later on. 3. Cook the cherries, stirring once in a while with a heat proof spatula, until they’re wilted and completely soft, which should take around 15-20 minutes on a medium to low flame. 4. Once cooked, measure out the cherry mixture into a cup and use 3/4 cup of sugar for every cup of mixture.The sugar is necessary to keep the jam from spoilage. 5. Stir the sugar and the cherries in the pot and cook over moderate-to-high heat. The best jam is cooked quickly. While it’s cooking, put a small white plate in the freezer. Scrape the bottom of the pot as you stir as well. Do not allow the jam to burn. 6. Once the bubbles subside and the jam appears a bit thick and looks like it is beginning to gel, (it will coat the spatula in a clear jelly-like layer, but not too thick) turn off the heat and put a small amount of jam on the frozen plate and return to the freezer. After a few minutes, when you nudge it if it wrinkles, it’s done. 8. Once it’s done and gelled, add another splash of port wine to the jam if desired. 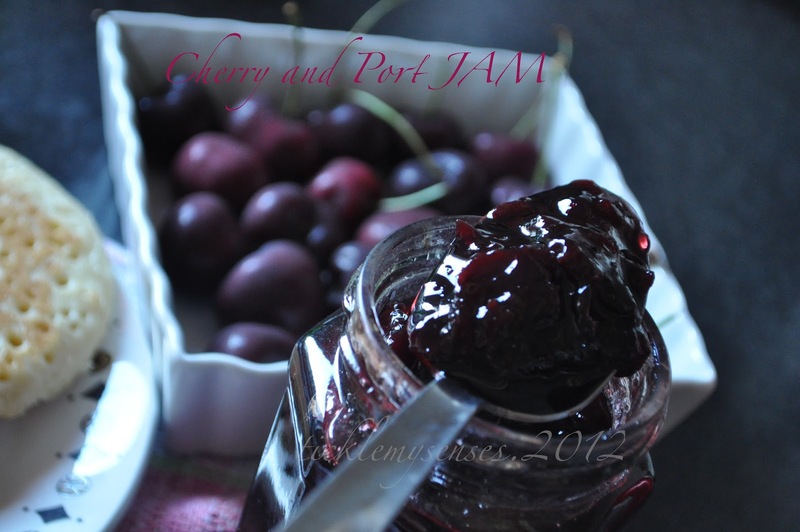 Port wine adds depth and sophistication to this jam. Ladle the warm jam into clean jars and cover. Cool at room temperature, then put in the refrigerator where it will keep for several months. A truly sophisticated jam for any occasion. Enjoy a thick slathering over a piece of toast, pancake, scone or on its own. 1. A jam is typically a conserve made with whole fruit and sugar that is then placed in jars and stored. 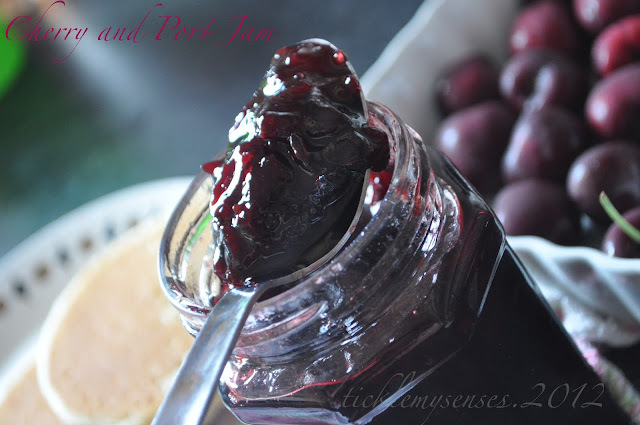 The sugar that is added to jams both sweetens the fruit and acts as a preserving agent. 2. Because cherries are fruits, their pectin content will vary by variety and ripeness. So it is likely if your jam is not jelling up you could add a splash of apple juice when cooking the cherries, which has a lot of pectin in it.